Take the whole family on an enchanting holiday excursion! 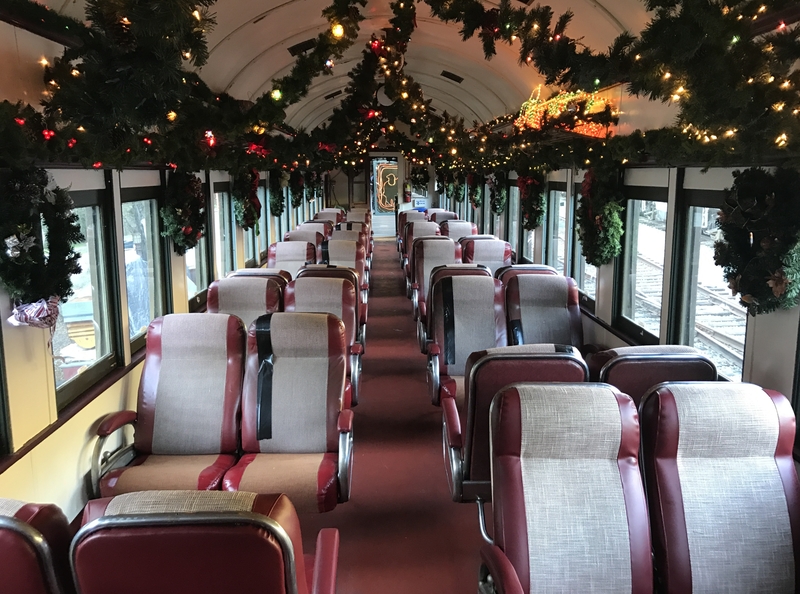 Enjoy an hour-long round trip through Niles Canyon filled with refreshments, music, and cheer aboard our antique coaches and open cars that feature holiday lights and decorations inside and out. 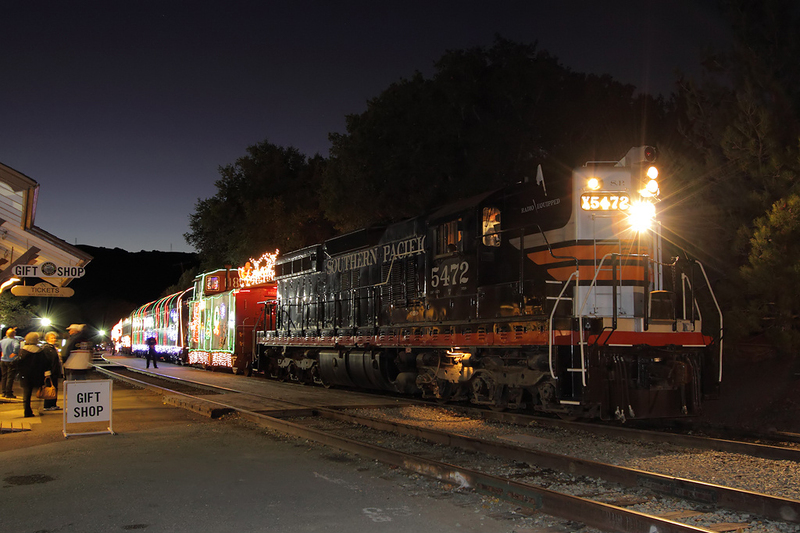 The Train of Lights offers a rare opportunity to experience a train ride through Niles Canyon at night. With one departure from Niles at dusk and a second departure from Sunol after dark, you can choose your favorite time to ride. The Train of Lights has been an annual tradition for many Bay Area families for more than a decade. Make it yours too! Trains depart from Niles at 4:30PM and Sunol at 7:30PM every Wednesday, Friday, Saturday and Sunday during the holiday season (except Christmas Eve and Christmas Day). The earlier Niles departure leaves when it’s still light enough to enjoy the beautiful scenery of Niles Canyon but dark enough on the return trip to enjoy the train’s mesmerizing lights. 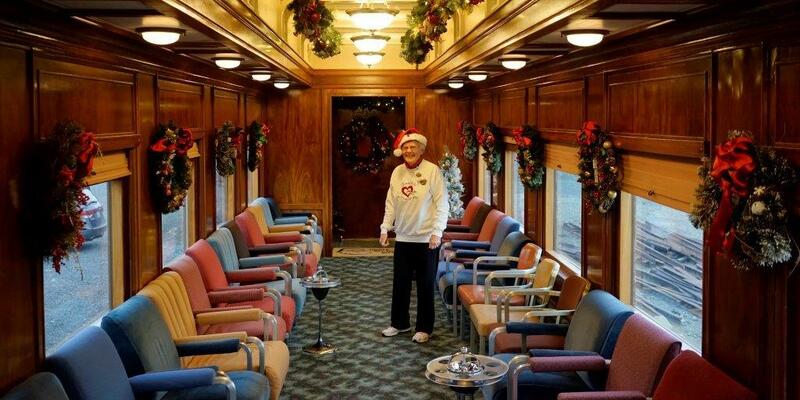 Coach tickets include an unreserved seat in one of our regular passenger coaches or open cars. First Class Dome tickets include a reserved seat in the Santa Fe 505 Dome Car. 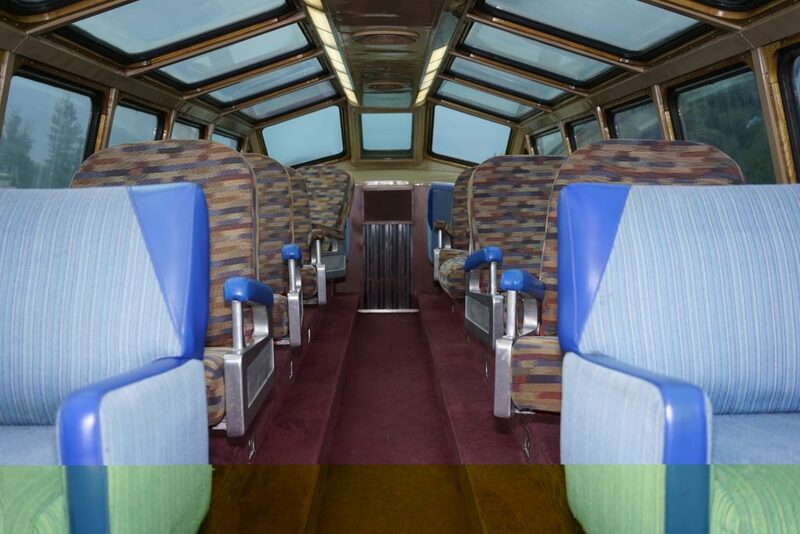 Enjoy swivel seats in the upper level glass dome during part of your ride for an unparalleled canyon view and a cozy lounge with attendant, and during the rest of your ride, enjoy the lower part of the dome car in the lounge, bar, or dining area. First Class Parlor tickets include a reserved seat in the Southern Pacific 10040 Dining Car. Enjoy the ride from some of the best seats on the train, in a car appointed with the original Cuban Mahogany interior. 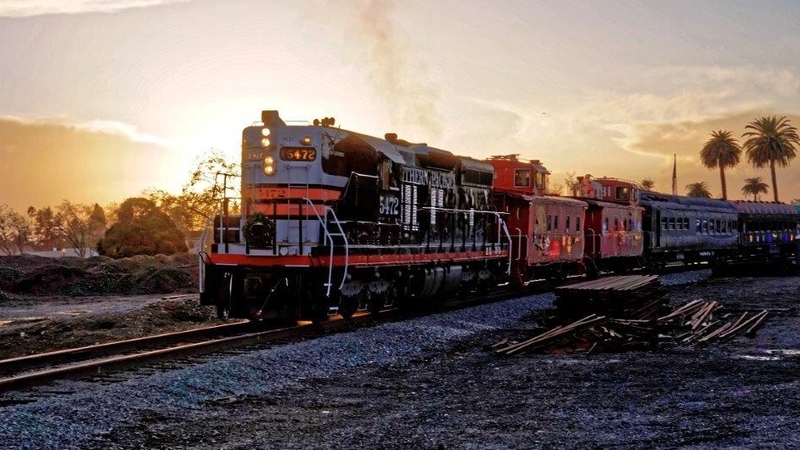 Reserve an entire caboose just for your group, and climb up into the cupola for a bird’s-eye view of the train with a docent aboard to tell you about the railroad. 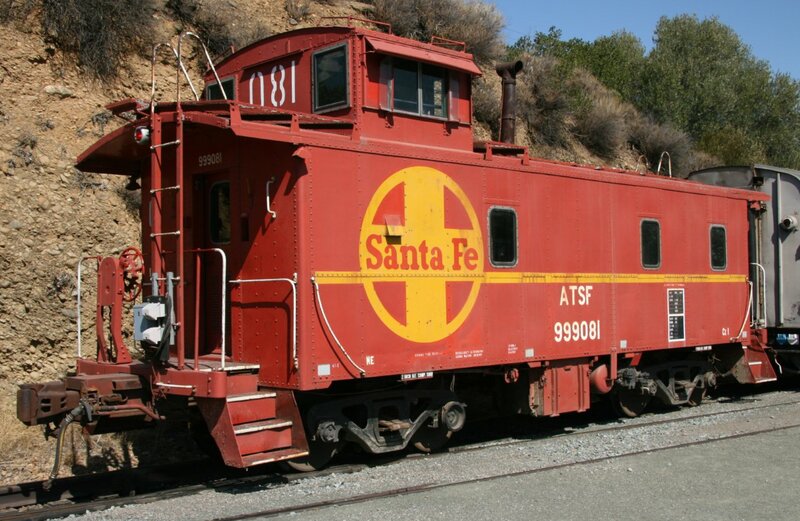 Our Santa Fe cabooses provide a special ride for groups of up to 24 people (depending on whether they are adult-sized or child-sized), and tables are available on-board for serving your refreshments. There are windows on the main floor, but the best view of the train is from the seats high up in the cupola. However, there are no bathrooms on board the caboose, and there is no access to the rest of the train (including the Commissary Counter) during the ride. Contact us for more information, rates, and availability of whole-train charters. Tickets are available online for all departures, and your ticket includes a round trip on your selected departure. These trains are very popular and often sell out well in advance, so we recommend you purchase your tickets as early as possible. All passengers aged 3 or older require tickets. Infants and children under age 3 do not need a ticket if they are sitting on a lap, but if your infant will take up a seat, then your infant will need a ticket. If you have a wheelchair or need other special assistance, please contact us. ADA wheelchair access is only to selected (covered) Open Cars, due to the narrow doors on our antique coaches. Train of Lights is our flagship fundraising event for the year, so tickets are not refundable. However, if you are unable to make your train, you may be able to exchange your tickets for tickets on another train for a $20 fee if there are a sufficient number of tickets available on that train. Contact us for more information. Trains run rain or shine, and the canyon can get very cold and windy at night in the winter. The train includes inside and outside seating, but we don’t guarantee an inside seat, so be prepared for cold, wind, and inclement weather and dress accordingly. Allow more time to get to your boarding location and park if there’s bad weather. The Train of Lights runs at night, so a small flashlight may be useful to help you move safely between your vehicle and the train. There are only ADA accommodations on designated covered “Open” cars, and wheelchairs may not move about the train due to the narrow aisles and doorways of the antique equipment. Check your boarding location before leaving home so you go to the correct location for your departure. Trains leave on time, so arrive early. Boarding begins about 30 minutes before the scheduled departure time, so please be at the station and parked at least a half hour before your departure so you have time to pick up your tickets and board. We board and seat passengers with special needs first, so if you need assistance boarding, you should arrive even earlier, and mention your needs to the train crew when you arrive. Parking lots are located at our boarding areas at Niles Station and Sunol Depot. There is limited ADA parking, so arrive early and have your placard visible. Large vehicles (Larger pick-up trucks, RVs, etc.) must park further away, so if you have a large vehicle, arrive even earlier. The entrance to Niles Station is located at 37029 Mission Boulevard at the corner of Mission and Sullivan Underpass in Fremont. DO NOT WALK ACROSS THE TRACKS from downtown Niles to our boarding area. Those tracks are an active Union Pacific Railroad mainline used by many trains every day. To get from downtown Niles to our boarding area safely, use Sullivan Underpass immediately west of our boarding area. Sunol Depot is located at 6 Kilkare Road in Sunol. Large vehicles must park about 1/4 mile away at the Sunol Glen School at 11601 Main Street in Sunol. You must pick up your tickets from the ticket window at your boarding location before departure. Bring your confirmation page or photo ID to the ticket window of the station. Station agents and train crews will direct you where to board the train. Once on board, you may freely walk through the entire train (except cabooses). We do not guarantee that a group will be able to sit together, unless you are ticketed for a First Class car. To increase your chances of sitting together, arrive early and board as a group. Saving seats for passengers who are not present is not permitted. Baby strollers are not allowed. The aisles of the vintage cars are narrow, there is limited space in the vestibules of the coaches to park them, and the train will be crowded, so please do not bring a stroller on board. The 13-mile round trip takes a little over an hour. After the first half of the trip, the train only makes a brief pause then immediately begins the return trip, so you may not get off the train until it returns to your boarding location.